How was your weekend? Mine was good, although nothing went according to plan. K and I were supposed to head down to Alexandria, Va to visit with his sister and meet our new nephew (she just had a baby boy). But unfortunately we had to cancel because one of the family members in Alexandria got sick. We made up for the loss of family time by getting together with my parents, my brother and his fiancé. My mom made an amazing seafood paella and I brought some cheese and bubbly, it was a great night. I wore these destroyed black jeans to my parents house and was so surprised my mom didn't have a funny comment about them. Something along the lines of 'what is that your wearing?' or 'I think your jeans are falling apart'. Not only do they have destroyed knees but they also have a ripped step hem at the ankles. 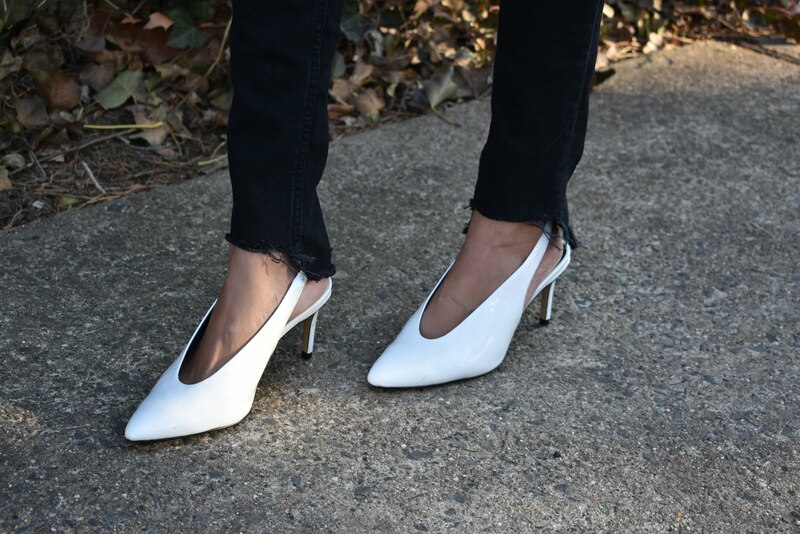 I have been wearing them non-stop lately because I think they give my outfits a slight edge. I'm not usually the most edgy person so a little change is always good! My full outfit details are below.